Aylesbury is a busy country town, with narrow Tudor streets and 17th century houses. Aylesbury - Travel by road - Aylesbury is on the A 41. Aylesbury is about 50 miles from LONDON. 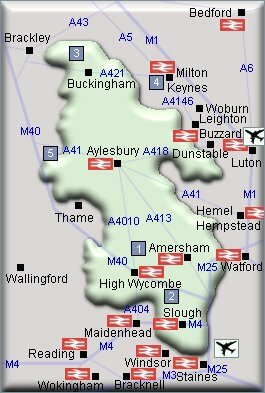 Aylesbury is 15 miles east of Bicester, 18 miles east of Oxford and 15 miles south of Milton Keynes. Aylesbury - Travel by train - Aylesbury Station, Station Approach, Aylesbury, HP20 1RU. CCTV. Ticket office. Waiting room. Refreshment facilities. Shops. Toilets. Wheelchair accessible toilets. Whole station step free access. Aylesbury - Sport - Aylesbury Golf Centre, Hulcott Lane, Bierton, Buckinghamshire, HP22 5GA. About 1 mile north of Aylesbury on the A418. Tel: 01296393644. Aylesbury - Shopping - Marks & Spencer, 35 High Street, Aylesbury, Buckinghamshire, HP20 1SH. Tel: 01296 424261. British Home Stores Aylesbury - 26 Friars Square, Buckinghamshire, HP20 2TA. Tel: 0845 8410122. Aylesbury - Other information - The most picturesque part of Aylesbury is in the mostly Georgian area around the church, which includes the Museum and Art Gallery, and the Roald Dahl Children's Gallery. Buckinghamshire County Museum, Church Street, Aylesbury, Bucks. HP20 2QP. Tel: 01296 331441. Aylesbury is on the A 41. Rail Stations (Not all stations shown). There is a station in Aylesbury. 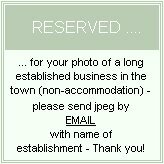 For hotels accommodation in other areas nearby see Leighton Buzzard hotels & Berkhamsted hotels.